Ford is recalling 1.1 million pickup trucks due to a defect that may prevent the doors from opening or closing properly. 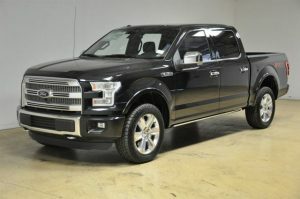 A 2015 Ford F-150 pickup, one of the models recently recalled by Ford. The recall affects F-150 trucks with model years between 2015 and 2017, as well as model-year 2017 Super Duty trucks. According to a Consumer Reports article on the recall, a faulty door latch or bent actuation cable may impair the proper opening or closing of the vehicles’ doors. The National Highway Traffic Safety Administration (NHTSA) has received numerous complaints about the trucks’ doors failing to latch and opening while the vehicles were in motion. No injuries associated with the defect have yet been reported, but the flaw poses a severe risk to drivers and passengers should the doors unlatch and open while a vehicle is traveling. If you or a family member suffered injury that may be due to a defective motor vehicle or other faulty product, the Oklahoma injury lawyers at Carr & Carr Attorneys at Law are here to help. Our attorneys have extensive experience in product liability cases, including those related to vehicle recalls. Please call us today at 877-392-4878 or contact us online to arrange your free consultation.